I find myself wondering when that pit in my stomach will disappear in those moments when I realize my grandmother is no longer just around the corner, putting on soup at her kitchen stove, deadheading the roses along the driveway, or balancing her checkbook in the back living room. There are days that life just happens and the fact that she is missing from it, seems to be part of what's normal. And then there are days where her absences brings a tightness to my throat and a welling of tears in my eyes. Or days that I forget she is gone and I catch myself thinking that we should head there for lunch, or stop by to tell her there are three ducklings taking up residence in our downstairs bathroom once again, because I know she'll laugh and be excited for the girls. A few weekends ago, my cousins and I sat in my living room, enjoying a glass of wine together and reminiscing. I made the comment that while I was thankful her passing was quick, and not a long, drawn-out decline, it also made it difficult for me to grasp it all. It was too easy to remember her healthy, strong, and just fine. Wasn't it just last week that we were sitting together on the bench under the Sweet Gum tree? Or checking in with each other to see who needed cat food from the feed mill? Last week, I sat in the kitchen with her big wooden recipe box in front of me. I was looking for a few family-favorite recipes. Of course, pouring over your grandmother's recipe box is not exactly the best thing to do to lift your spirits, but there was still a sweetness to it all. The greasy recipe cards typed up on a typewriter, the little slips of paper with her handwriting– recipes from Terry, NancyAnn, Paige…. Judging by the recipe box and the recipes inside, I can tell my grandmother has had this for a really long time. I'm guessing it's been the recipe box that's been sitting on her counter for as long as any can remember. When I went home that afternoon, to file away my copied recipes, I remembered that I'd had it on my mind lately to organize my recipe box. I have a recipe box on top of my stove full of a some favorite recipes, as well as some I've never tried, some I've clipped from magazines. And I also have a stack of notecards scattered in a drawer. And a file folder of recipes stashed between the cookbooks on my shelf. And a few blowing around the top of my dresser upstairs. I decided it's time to start my last recipe box. The one that will sit on my counter for as long as anyone can remember. Several months ago, I bought myself a new recipe box with this in mind. But it has been sitting empty on my countertop. After going through my grandmother's recipe box, I realized how much of her is inside that box. Her handwriting. Her favorites. My favorites. Family favorites. So I'm slowly cooking and baking my way through my disorganized, mismatched collection of recipes. When something is a standard, a classic in my kitchen, I move it to it's new, final home. Eventually, I hope to have my own recipe box full of recipes–tattered and splotched from years of use. That they'll become our family favorites. Passed down. Collected. Copied. Loved. you have a gift, such evocative, beautiful words…. This was beautiful, Molly. It hits home the fact that all the little, boring, daily things we do for our family are the things they are going to remember about us. That we’re making our legacy as we go along. All just from a post about recipes! And a very nice recipe box, that one. I made my grandma’s cheese cake yesterday. I like bringing her memory with me to family gatherings. Its been a little over a year since she past. I don’t yet delight in cooking the way you do (do love baking with children); I just wanted to say how beautiful this post is. What a gifted writer you are! Have a great day! Thank you for sharing. Oh Molly, here I was coming for a cheer me up and I get weepy reading this post. My grandmother past away this past November and I’ve been missing her greatly these past few weeks as I typically get to see her more often during the summer months when we head to the family cabin. Those family recipes are definitely keepers. My oldest daughter already asks for certain recipes that I should make her and wants to know what makes it taste sooo good. Like how I can make pancakes taste soo good even without butter and syrup on them…the secret is vanilla but I tell everyone it’s “Love”. I enjoyed this post so much…. My maternal grandmother (more of a mother really) has been slipping away from me into dementia…. I often sit with her, looking at her, my heart aching for, but she is gone… I can still touch her but the relationship that we had has slowly drifted. 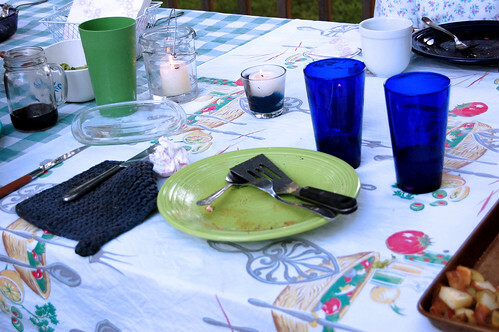 I have her recipes, all of her sewing scissors and notions, her knicknakcs on my kitchen window sill….. I miss her…..I love your idea of creating your own recipe box. 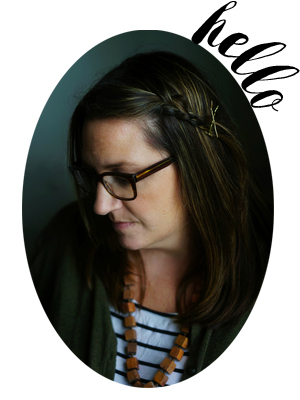 A revival, a birth or sorts… Thank you for sharing. molly, this post has touched my heart in a big way. lately i have been thinking of my grandma, a lot. she passed away about 8 years ago. just friday i was absolutely panicked over thinking i had lost her zucchini bread recipe. a beautiful card written in her handwriting. luckily i found it and with a smile on my face proceeded to make three loaves. i too have recipes scattered all over the place. family favorites and one’s i have never tried before. you’ve just inspired me to finally take on the task and make sure that i leave the favorites behind in my handwriting for my children and grandchildren to one day go through. The way you feel about your grandmother is the same way I feel about my dad. He died 9 years ago, and I still catch myself looking or listening for him. Just proof that when a person is part of your life for that long, they never really leave it. This made me sob. My grandmother always taped her the recipes that she used over and over to the inside of her cabinets. That way, she could just open the door and there was the recipe at eye level. I have some of those recipes. And I am doing the same thing. Now I need to go find me a really cool recipe box like you have and get one started. I read an article the other day about how people are not passing recipes down. The reason being is that everyone just goes and looks them up on the net. I hate that. If only my grandma cooked! it’s a running joke in my family that she doesn’t know how. This is a very sweet memory of your gram, preserved, as it were, for the family, and now you’ll have the same. Molly, I picked the same Martha recipe box for my grown up girl collection of recipes to pass on. I love it. I love the sense of history and connection and love the recipes provide. Especially the hand written ones. I still wonder when that pit will disappear, and it’s been… gosh, almost 9 years (still feels like yesterday). This brought back many, many memories. And a realization that I now have my grandmother’s cookbook, chocked full of her recipes, her adjustments to the manufacture’s “mistakes”, handwritten notes as to how she did this or that… I also realize I need to do this with my recipes, because I know how much I cherish that well worn, falling apart book from Grammie. Thank You. In 3 days, it will be ten years since my grandmother passed away. I wish I had her recipe box (or anything that belonged to her, actually). I don’t know what became of it, but I sure remember it. I’m sure someone in the family kept it. I can only hope. Beautiful post. It’s made me remember some sweet memories. Thank you. Hi Gail,The recipe box is from Martha Stewart’s collection at Macy’s. When I bought it, several weeks ago, it was on a pretty good sale. You can find it here on their website, too. What a fabulous post. I have some of my Grandmother’s recipes and recently cleaned out my box. Last year I made my daughter an apron and tucked some heirloom recipes in it for her box. My thought is to have separate boxes for each girls where I write out the favorites over the years. This post did it Molly, I have your lovely words back. I don’t have a recipe box-all our family favs are in my head. Or they are made up as I go along (I find I don’t like following recipes unless I’m baking) and I can’t replicate them exactly next time. But I am very envious of people who can and do use recipes! This is a beautiful post, Molly. And it made me sob. My grandmother hasn’t died but we are losing her to Alzheimer’s. It has been incredibly painful. When we were clearing out her home a year ago January, I clung to her mixing bowls, aprons, dish towels, and the napkins she sewed. Crystal and silver be damned, I wanted the things she used daily. I wanted them in my kitchen, I wanted to create new memories with my family, and I wanted her there with me everyday as I chopped onions and stirred sauces. I never thought to ask about her recipe box, and now I’m desperate to find out where it is. betsy, i completely understand–the wanting of those every day things that belong to your grandmother. I feel the same way. and thank you, for your kind words. I’ve kept a spiral bound journal full of recipes ever since my daughter was born five years ago with the exact thought in mind about handwritten recipes to hand down to future generations. Occasionally something gets spilled on the pages. Chocolate smudges dot the chocolate chip cookie recipe page. I love it. such a sweet post. Recipes are so meaningful to me. I feel close to my Grandma every time I bake her roll recipe. I remember the quilted chicken that she had to cover the roll basket and keep them warm. I wish I still had it. I love your recipe box, btw….where did you get it? Your sentiments about your Grandmother deeply resonate with me.My Grandmother has also passed away. As you had mentioned it is difficult to remember at times that she just is not around. 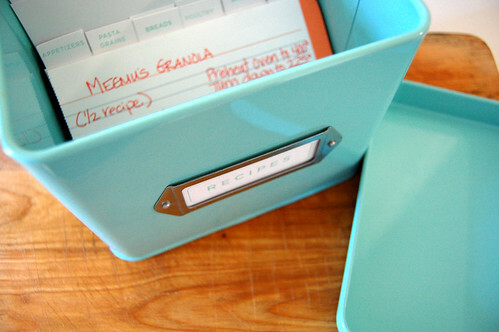 Your writing and your recipe box is a beautiful tribute to your Grandmother! My Nanny taught me to cook. She bought me my very own copy of the Betty Crocker Cookbook for Kids when I was 8 and Sunday family meals were my job for a good 2 years after that. When I was 11 she was diagnosed with Alzheimers and had a fairly rapid descent into that illness. When she explained to me what was happening to her I remember saying that we needed to cook all her favorite things together quick so I would know how. She pulled out her 2 big recipe boxes and I spent most of that summer copying away at the kitchen table like some ancient monk. And I’m so glad that I did. My phone will ring at least once a day with a friend or family member asking for a recipe for something that I have made at one time or another.I then have to search through the many folders I toss my recipes into. The one thing I will be remembered for is my cooking. I need a forever recipe box.Wonderful post Molly. You seem to have take a page of out my life in the recent months. I lost my beloved Granny at the end of January, very suddenly. I did the same thing one day, sat down to look through her recipes and found the main courses to many of my most happy memories. And that’s when I started my recipe collection as well. Good luck on yours! when my grandmother died, the only things my mom wanted (there were seven kids dividing up the stuff in the house) were the recipe box, the betty crocker cook book and two pie tins. i am so glad she went the sentimental route. Very sweet post. I have a recipe book that I started when I was in college. I asked everyone to write out in their own handwriting the recipes that I always remember them making. But now the book is falling apart and I wish I had cards. Or that I hadn’t glued the recipes on both sides of the pages. A handwritten recipe is a beautiful thing. This really makes me think about how I store my recipes. I love the handwritten mode, but I just can’t trust myself to keep it maintained, so I keep them stored electronically instead. But I miss my mom’s old wooden recipe box.